Don't know what RODS are???? I've been getting e-mails from all over the world and although I haven't seen the footage, here are some stills sent to me from a viewer who happened to tape them. There is a report that says RODS and BATS are seen flying about in the same scenes! I am looking for this footage if anyone captured this contact me ASAP as I need to see this and look at what else might be in the same shots. Last week I found a ROD that zips through anti aircraft explosions that are over the city and this RODS flies through effortlessly and does not get hit nor affected by the explosions in the air. Clear shot and it is moving VERY fast. 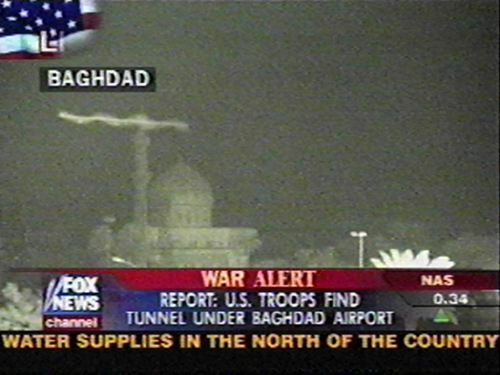 At just before 4:00pm EST on the Fox cable news channel in Long Island New York, I saw many rods flying around on one of the stationary night vision cameras that they have set up in Baghdad Iraq. I wasn't sure what I was seeing at first but then I saw some very clear images of several of them flying slowly in front of the camera. Some even flew in a very similar circular pattern just like the ones that I have seen in videos at the coast to coast web site. The very distinctive spiral "oscillating wings" are amazingly clear during this footage. The footage lasted for several minutes and then switched away before I could get a tape of it. Hopefully you can acquire a copy of this footage and see this great footage for yourself. While watching Fox News this afternoon (3:58 pm) i clearly saw two rods swooping through the green night vision picture alongside the much more numerous bats. 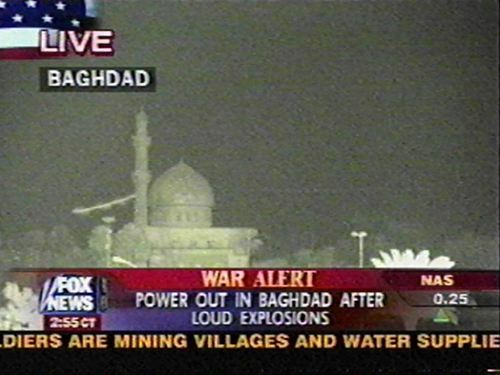 The camera is the one facing a large mosque with the minaret on the left. I'll bet alot of footage is out there buried in the archives of people recording the war. I'm pretty sure CNN and MSNBC are also sharing the feed off the same camera. I will try to capture something and let you and Jeff Rense know if I succeed. Have others notice this yet? I just saw three rods on Fox news. 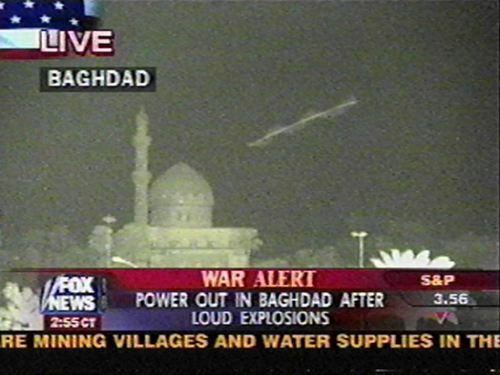 They were showing Baghdad "live" at night with a night vision camera at 3pm central US time. one rod came from the left going to the right and went away from the camera then turned to the left. This could be the mainstream proof that this is real.